Christmas is all about being merry, making some unforgettable memories and of course, the delicious food and drink to indulge in across the festive season! 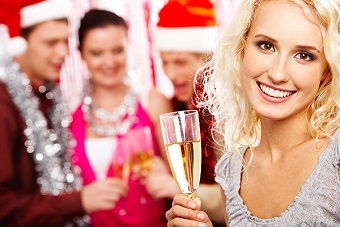 If you and your team are looking for a Christmas party idea with a relaxed, more informal atmosphere then why not have your Christmas with Foundation Bar in London, a chilled setting perfect for any festive celebration. The bar is situated right in the centre of London, making it easy to travel to and a prime location to feel the Christmas spirit, with beautifully decorated venues and lots of people out to celebrate. Dress to impress and take your team out for a real treat with a chance for everyone to let their hair down after a hard working year. When you arrive at the low lit, urban decorated venue a member of staff will guide you to your reserved area, which be available to you all night as a place to relax, chat and toast to the Christmas holidays. Everyone in your group will also receive 2 drinks vouchers each to use whenever you like throughout the night or to accompany your food and get the party started. During the night, your festive buffet will be served and left for you to pick at, try new dishes or simply have the classics you know and love – it’s totally up to you! The Christmas buffet is made up of a variety of different flavours and tastes, including classic Yorkshire puddings and a Christmas dinner on a stick as well as some more exotic options like red Thai chicken skewers and smoked salmon pin wheels. To finish off, there will be some mini brownies and fruit skewers to enjoy before the rest of the evening continues. After the feast, you have the freedom to make the night your own in the fantastically versatile Foundation bar, which boasts several different rooms to enjoy depending on what kind of party you want. Whether you want to have a quiet night with a couple of drinks in your reserved area, or hop on the dance floor and bust a move in celebration of the festive season, a Christmas with Foundation Bar in London is sure to complete your evening. Does this Foundation Christmas party in London take your fancy? If so, don’t hesitate to give us a call on 0161 341 0052 for any more information about the Christmas party, or to have the whole event organised for you!